This morning’s headline was set in the giant typeface reserved for only very good or very bad news. This time it was the latter: "Kidnaped [sic] Child Slain By Fiend." For three days now, Angelenos have followed the story of 12-year-old Marian Parker, lured away from Mount Vernon High School by a man who said her father was ill. The kidnapper demanded $1500 (close to $18,000 in 2007) for her safe return, and Marian’s father agreed to pay it. Shortly after 8 o’clock last night, the kidnapper drove up to the agreed-upon meeting place. Marian’s small form was visible in the passenger seat. "Here’s your child," he told Parker. "Give me the money and follow instructions. She’s asleep now." 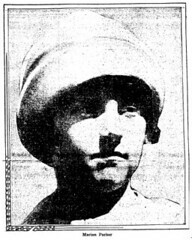 The ransom changed hands; the criminal drove a short way and deposited Marian’s blanket-wrapped figure on the lawn at 432 South Manhattan Place. Perry Parker rushed to his daughter, scooped her up and—in a waking nightmare that must have haunted him for the rest of his days—discovered she was dead, her eyes wired or sewn open in a hideous simulacrum of life. A wire was bound so tightly around her neck that it cut deeply into her flesh; she had been disemboweled and her legs hacked off close to her body. The Times was filled with stories comparing the Parker case to Leopold and Loeb and a host of other grisly child murderers. Crowds of bloodthirsty thrill seekers (the Times estimated over 25,000) thronged past the Parker household at 1631 South Wilton Place (address helpfully supplied by the paper). The horror continued today. While most of Los Angeles was still reading its morning papers, citizens aiding the police found five gruesome bundles on a lonely road in Elysian Park. The first contained Marian’s arms and legs; the last, found by "two small boys, carrying on the search," held her viscera. 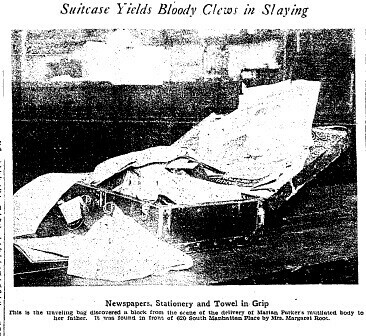 A blood-soaked suitcase previously discovered in the gutter at 620 South Manhattan place is believed to have held the child’s body. Then, late this evening, the police found an abandoned Ford roadster, license number 667-67. It is believed to be the automobile driven by the kidnapper to the meeting with Marian’s father. A massive manhunt is underway for the fiendish killer.